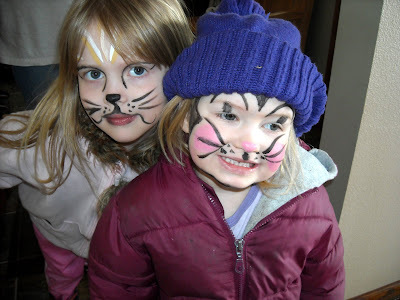 Creative KJ's Corner: Wordless Wednesday - My kids love having an artist in the house, especially when the face paint comes out! WOW! My girls would be in heaven if you lived close to us. :) They absolutely love to have their faces painted. We have a city carnival coming up in a couple of weeks and I'm hoping they will have a face painter there. They look like they are ready for the Broadway Musical Cats...how fun! I love it!! They look so cute with their faces painted all up!! I love it!! So very cute. So Cute! Bet your house is fun.